New Distribution Capability – what exactly is this? Some consider NDC to be no less than a new technology standard with the potential to revolutionize the distribution in the aviation industry. Yet others are convinced that this IATA initiative means one thing more than anything else: plenty of big question marks. PROLOGIS conducted a comprehensive market survey among stakeholders to learn about the market’s opinion on NDC. If you wish to get a broader understanding of the topic, please have a read through the study report or email us to receive further information. Since low-cost-carriers entered the European market, the idea of unbundling airline products has been gaining in significance. In the last few years, the traditional airlines have started to adapt the unbundling concept to increase ancillary revenue. This works for the low-cost-carriers simply because they sell most of their tickets on their own websites. But for traditional airlines, which predominantly use Global Distribution Systems (GDS) to sell their products, placing unbundled products in the market is problematic. In the 1970’s, the implementation of GDS was an innovation, but today this technology is viewed by some as being no longer current. Other distribution channels and technologies, such as direct channels or screen scraping, are more able to make unbundled airline products available to travel agents. This was the reason why the International Air Transport Association (IATA) began to review the current distribution standards. 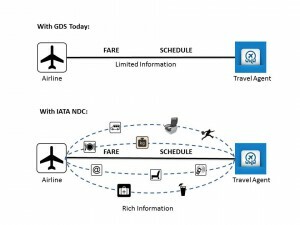 With the NDC project, IATA together with representatives from airlines, travel agents and IT suppliers started to create a new global data standard, which can handle products from all different airlines, making the travel market more transparent and bridging the gap between direct and indirect sales channels. Airlines will be able to sell all products through all channels. GDS currently use the message protocol TELETYPE and EDIFACT (Electronic Data Interchange For Administration, Commerce and Transport).This is a static display, showing prices and flight times with limited product information for comparison. But this is not the way in which many airlines want to market and sell their products today. NDC will be based on the Open AXIS XML (Extensible Markup Language) schema. XML is an open data standard and available for use by the entire industry to set the parameters for transmitting data between partners in the air travel distribution value chain. This will reduce the investment required by airlines because they already use XML for their direct channels (websites), and will enrich the discussion about NDC with fundamental knowledge from the airlines. Open AXIS XML ensures that NDC is an open, robust and transparent internet-based data exchange standard in line with industry needs. NDC will transform the distribution model under GDS. Features which are only available via the direct distribution channels, such as ancillary services (extra bags, priority boarding) and on-board amenities (meals, WIFI, extra-legroom economy class seats) can be viewed and booked using GDS. A previously static display will become a dynamic and flexible interface with rich content and the possibility to tailor offers to individual consumers. The interactive and graphic display will offer customers an enhanced online shopping experience, with the ability to compare and transact airline offers across many dimensions in a transparent fashion. The customer can choose whether to get an anonymous offer or log in for a personalized offer. Overall NDC will close the gap in product availability between direct and indirect sales channels, stimulate competition and innovation and offer more choice to the consumer. 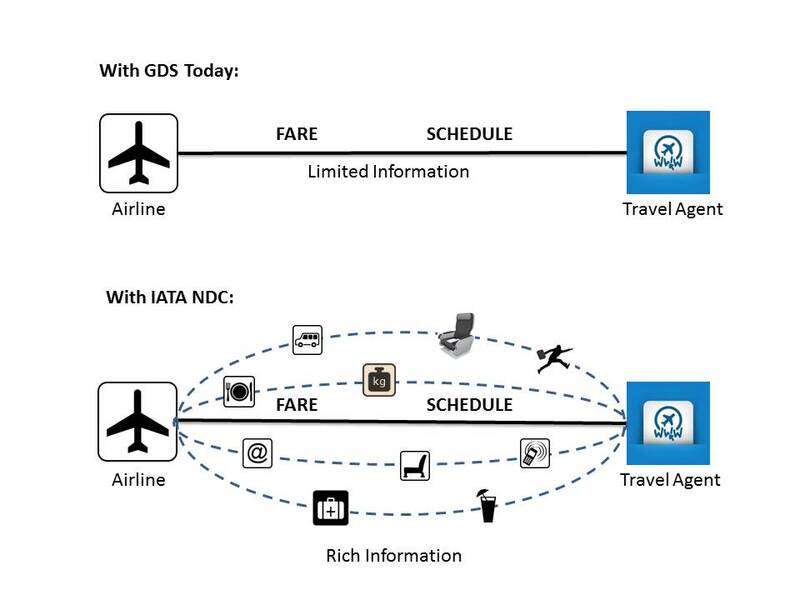 The IATA NDC project is already being piloted with selected partners to create the messaging standard.